??? Export into 8 formats. Documents of any type can be exported into Adobe PDF or graphical files in 7 popular formats: TIFF, JPEG, PNG, PCX, DCX, GIF or BMP. ??? Work with multipage documents. Several documents of various types can be united into one multipage file. ??? Universality. The technology of virtual printing makes it possible to convert documents of any type, including multipage reports, technical drawings and commercial posters, into a chosen format. ??? Practicality. The direct export of a document into a graphical file (instead of printing and scanning a paper copy) economizes on expendable materials and time. ??? Ease of use. For exporting documents of any type into Adobe PDF or graphical files all that is required is to print them using the printer named 'Universal Document Converter'. ??? Advanced algorithm of quantization. Advanced algorithm for image quantization makes it possible to produce the highest quality copies even when converting them into a black and white format. ??? High resolution. The ability to export documents with a resolution up to 2,400 DPI enables you to save all elements of design of advertising materials and the minutest details of drawings and electronic diagrams. ??? Automatic margin cropping. The function of automatic cropping of empty margins makes it unnecessary to edit graphical copies of tables and diagrams before placing them in presentations or text documents. ??? Economy of system resources. Low consumption of system resources enables you to export documents of practically any size and containing hundreds of pages. ??? Flexibility in configuration. The flexibility in configuring the program makes it possible to choose the optimal ratio between the quality of copies of documents and the size of output files. For example, for publication on a website the smallest possible files are needed. On the other hand, for preparing documents to be sent to the printshop, files are required that are of high resolution and compressed without quality loss. ??? Quick configuration. 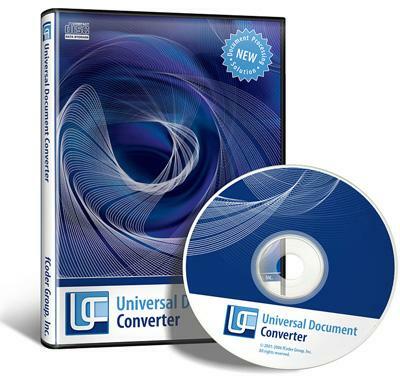 A profile library (collection of settings with optimal conversions for standard conversion tasks) makes it possible to configure Universal Document Converter with two clicks of the mouse. ??? Remote usage. Compatibility with Microsoft Windows Terminal Services and Citrix makes it possible to use Universal Document Converter from remote computers. ??? Scalability. The possibility to share Universal Document Converter over a network and use it from workstations allows for a significant increase in speed for the conversion of documents. ??? COM-interface. The presence of a COM-interface simplifies the compatibility of document flow systems with Universal Document Converter. ??? Added ability to completely automate installation of the program.